Aerial Warfare: The Battle for the Skies. Frank Ledwidge. Oxford, UK: Oxford University Press, 2018. Fiction writer Pat Conroy once commented on his own works Beach Music and Prince of Tides, “I would place [these works] before the altar of God and say, ‘Lord, this is how I found the world you made.’” Frank Ledwidge could make a similar claim about his new work published by Oxford University Press, Aerial Warfare: The Battle for the Skies. A note of warning for the prospective reader, those who consider themselves scholars of air power will find little new in this work and nothing to challenge any preconceived notions about the employment of air power, but that was never the intention. 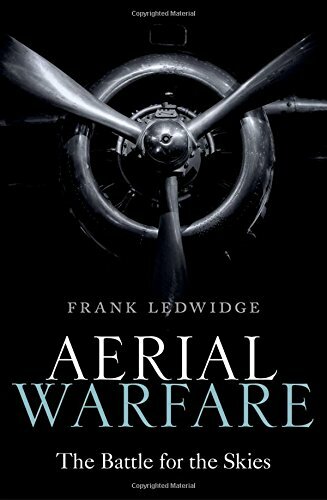 That said, what Ledwidge created is the single finest primer on air power covering every aspect from, if you’ll excuse me, balloons to drones. Ledwidge breaks his work into nine chapters, running chronologically from “Foundations” through “Per Ardua ad Astra?” (Through Adversity to the Stars). In between these sections come a chapter on “Beginnings: The First World War,” two on World War II, a chapter on the Cold War, and one on “The Apotheosis of Air Power 1983-2001.” A seventh chapter details the history of air power since 2001. Ledwidge then covers the inter-war period and adroitly demonstrates how each nation (the U.S., the U.K., Germany, Russia, and Japan) learned lessons from the First World War and adopted them their own particular style and understanding of aerial warfare. In America, the Air Corps Tactical School engendered the concepts of strategic bombardment that eventually led to an independent Air Force and a culture lasting for the next five decades. If the author adds something missing from other texts on the subject, it is the admission that the Combined Bomber Offensive during the Second World War entailed a high cost to French and Italian civilians. In France alone, 53,000 civilian deaths are attributed to allied air power, something expounded upon in Stephen Bourque’s recent work Beyond the Beach. As the world entered the post-war ideological divide of the Cold War, Ledwidge notes that roles did not change for air power; only the technology changed with the advent of missiles and jet aircraft. While the usual suspects, at least from the American perspective, of Korea and Vietnam are present, Ledwidge does not overlook the use of air power in Africa and the Middle East either, areas ripe for further exploration. As he transitions to what he calls the apotheosis of air power, Ledwidge points to John Boyd and John Warden as the two modern theorists around whom air power has been built. Readers of The Strategy Bridge are no stranger to Boyd, his influence, and his OODA Loop, although Warden’s name might be lost to those not familiar with much of recent air power history. Warden was the original mastermind and designer of what was adapted into the Desert Storm air campaign plan, although he remains something of a pariah in certain Air Force circles. If there is a critique to this work, it is that the footnoted material is lacking and gives a dearth of sources for those interested in exploring more fully air power and other directions to go in. It is a small, but necessary, critique in an otherwise fine work. This single volume is perfect for the student or military accession looking for a fantastic introduction on the history of war in the air. Serious scholars might consider going so far as to obtaining multiple copies of this work to hand out to colleagues in other fields. It is a book perfect for classes on the history of warfare. It will find itself on numerous college syllabi and a place as one of the great air power textbooks for the foreseeable future. Brian D. Laslie is deputy command historian at the North American Aerospace Defense Command (NORAD) and United States Northern Command (USNORTHCOM). He is the author of The Air Force Way of War and Architect of Air Power. The views expressed in this article are the author’s alone, and do not reflect the official position of the U.S. Air Force, North American Aerospace Defense Command, U.S. Northern Command, the Department of Defense, or the U.S. Government.